I made a few decisions. 3. After I finish this edge over the next week and 1/2, I need to take a break. Embarrassingly, I have tendonitis as a result of tatting.....geesh! I actually do go to the gym frequently and will be working on the strength of my forearms in order to counteract the movement of tatting. Hopefully, I'll be able to tat and strengthen the forearm. Until then.... watch my back....no, really, it's a gym injury. 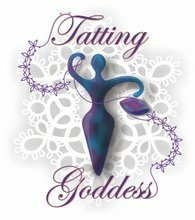 Have a wonderful day and happy tatting!! Greetings to you all!! I've been tatting but have little to show. Sorta. I've got a long rambling post with a few more pictures than usual. I'm working on Three projects. However, there's not been alot of variety in my tatting recently. Here is the most interesting piece of tatting. It's the crown piece for another baby bonnet. So, as a result, Project #2...I decided to pick up the fillet panel and try to get it to a desired length; a length that will match the endless edge. It is desperately boring. chain, chain, chain, chain, chain..... you've got it. I began thinking... (always dangerous)... with the work I'm putting into the fillet panel, I'd hate for it not to be part of a family piece....so, I started creating in my mind. Here is what I'm thinking. I placed the fillet over the bonnet piece...now look. Obviously, the piece under the fillet will not be there....I'll be creating another piece of wide lace to match the bonnet. It will be the hem for a christening gown and will match the crown piece of the baby bonnet. I decided that the loose form of the current edge needed something different than the fillet panel...so, I'm attaching a familiar two pass edge. Then, I believe the endless edge will have an end... But, I must ask you all, "how long should an edging be if it has no purpose?" votes please! All that rambling...I hope you can decipher the content and make sense of it. I'm going to try to be a bit more attentive to your posts as I have missed the blog world! Have a wonderful day!! I'm learning to be careful not to commit to producing major tatting pieces for expectant mothers and grandmothers....(with a grin)... unless I want the urgency of deadline to guide my tatting endeavors. It's not the recipients who are pressuring me...it my crazy perfectionist self. I believe I am about finished with my first tatted baby bonnet. There are many comments to be made about this piece. Here are a few photos of the bonnet as it stands. It took me awhile to figure out how to attach the two pieces of tatting. I began improvising the garden path between the two pieces and occasionally joined where it seemed most appropriate. It caused some gathering... I thought I might snip it out and begin again...until I started to really like the gathering and noticed it looking a bit more 'lacy' and not flat or 'fussy'. I started in the middle and worked my way out. Because the garden path pattern is asymmetrcal I needed to be a bit creative with the connective work. The back is gathered by a ribbon that can be retied as the baby's head grows. I don't mind the gather either. I will work to perfect the bow and maybe insert a slightly wider ribbon over the top. In the end, I'm quite happy with the outcome and will probably try to duplicate this one more time. Oh, about the shuttle from my Great Aunt Lucy... I actually have a copy of the patent... and now I'm even more interested in the hook. Some of you have shown me a hook pointing out. However, this one hooks back toward the shuttle. I'll try to get a good picture of it and post in the next blog entry. Happy tatting and have a wonderful day!! I lost my Aunt Martha this past week who succumbed to cancer. She was a wonderful woman who loved her family. All of us converged onto Northwest Ohio to memorialize and celebrate.... which we do very well. It is spring in Ohio. The temperatures are warmer and the flowering bulbs are beginning to reach for the sky. The crocuses are out and almost spent for the year. Below you see the wonderful clusters of crocuses in my Aunt Mariann's front yard. As we sat at the wake on Tuesday, my mother bragged to other family members about her tatting son....(geeeeshhh). Having been self-taught, I never knew whether there were any other tatters in my family. One of our cousins described a shuttle she had from our Great Aunt Lucy Freyenberger (1878-1979). Surprisingly, she stated that she wanted to give it to me. I know how important our family heirlooms are and the traditions that follow them. To my amazement, she handed me a box before the funeral and in it was the shuttle below. It's a Boye shuttle with a patent date of April 10, 1917. I thought..., "oh, cool another metal Boye shuttle." But wait, I pulled out the bobbin and was very surprised to find it attached. I have never seen a shuttle like this and need to research it a bit. Additionally, the point on the shuttle is bent back on itself. I don't know if this was standard, if Great Aunt Lucy bent is intentionally, or if it's been bent over the years of storage. If you have knowledge of these shuttles, I'd be very interested in learning more. And one more note....the baby bonnet is finished all but hiding two ends and adding ribbon. I will post something in the next couple days. Well, here is the next installment for the back of the baby bonnet. I began the little 'bump up' with a single five petal flower and improvised a bit of the 'garden path'. I hope to work chains and clover leafs to attach the back to the top of the bonnet. The length of each chain will have to be improvised to smooth out the roundedness of the back. I will probably attach a bit of the #50 edge onto the bottom of the back. This will allow me to add a ribbon to the bottom of the back. Now, off topic. I don't know why my pictures are uploading in the portrait position rather than the landscape position. I've been taking them with my iphone. This (for some) may make sense...it just puzzles me. So, I retook the pictures and just settled for the portrait pics. Why is it that I don't do anything simply....?! Normal is not one of my usual labels. I've been trying to figure out why I'm not satisfied with the older baby bonnet patterns. It may be because they appear to be a bit flimsy...but, I don't know that to be true. Oh, well I'll keep plugging along with my version. As I'm tatting this row, I begin to think that I need the back to be a bit more 'oval' than half round. So, I believe I'm going to add a couple small flowers in the middle of the next round. This will begin to stretch the half round into an oval in addition to bringing the flowers of the top into the back of the bonnet. Here's another look. So, what do you think? Half round or somewhat oval? I will probably finish the row and add the flowers this evening. I'll show you the progress when I can figure out if it's the 'right' thing to do. The final, final edition of 'Christmas stocking prototype #1'. I am so happy with the outcome. Several things learned along the way. Here is a picture with a shuttle for perspective. The question of the day....will I continue obsessing over Christmas stockings? Or, is there another project calling my name? I'm sure you've been wondering about our twelve step program......I'm ignoring the entire idea of tatting addiction. But, will need to remind myself sometime in the near future to breathe....oh, wait! That's what this addiction is all about. Breathe in, breathe out...tat! Here is the final decision regarding the placement of the lace on the first stocking. After all your wonderful comments and suggestions I started to fiddle with the lace on the stocking. Then, I realized you all were right. Some said, 'the top of the stocking' while others said, 'dangling from the lower edge'. Well, how about splitting the difference? It made all the difference...at least in my humble opinion. I blocked the lace. It was quite interesting trying to figure out how to block both sides. So, here was my process. As you see, I don't pin every picot. That's a bit too tedious for me. I have begun to attach the lace and will be done some time this evening. I'll then take pics and let you see the final project. And Finally, You will be spared of my endless drivel about the 'Christmas stocking'. Yesterday was spent trying to 'perfect' the Christmas stocking. By that, I'm referring to the actual stocking. I figured out how to keep the top seam from puckering and now have two sizes. I'll show the two in just a bit. Your comments are all VERY useful. I see that I'm going to have to do a series of stockings. I think you all are right...(if there is a right and wrong to this). I've not...well, let me show you. Below are the two smaller stockings with the tatting on the very top and one with it hanging from the 'flipped out' edge. Both are pleasing on some level. The snowflake is not a 'must have'. It's another possibility. Now, here is the third, larger stocking. I'm actually really pleased with the outcome of the stocking. One little change for the future...I'll shorted the 'flipped out' satin lining by 1/2 inch. The angle of the photo is a bit odd...making the toe look a bit wonky. None to worry, I don't think it looks that way in person. So, as you see, I'm on my way and have my very own projects for future gifting. Sorry for the extended absence! I've been a bit busy lately enjoying the break between semesters. A Happy New Year to you all!! If I recall....we left off with Step Two of the twelve steps for addicted tatters. Well, step three is just going to have to wait for a bit longer. I'm ignoring my addiction at this moment and just trying to figure a few things out. My absence was due to a secret project. I wanted to complete the first demo before blogging about it...however, I need opinions from my tatting peeps. So, here is the project. I started tatting an edge over the Thanksgiving break. I wanted to do something that looked like icicles for the top edge of a Christmas stocking. So, here was the beginning. Here are some close-ups of the tatting. And, NO, it's not attached. The tatting is a bit too big for this stocking. I'll have to enlarge the pattern for this piece of tatted edge. There are several patterns used in the edge. One was adapted from the blomqist book. I added length a clover leaf for the longer icicles. I also added a short motif between each longer icicle. The top of the edge is from Austin's 'A New Twist on Tatting'. Now, I've got to figure out how I'm going to attach the edging..
Do I attach it to the top of the stocking? Do I shorten the turned out lining and attach it on that edge? This may not be too clear...not sure. Let me know what ya'll think. BTW...I missed ya'll and hope to be checking in more frequently.